It has been a banner year for the green beans in the garden. But then we have always had good luck with them. Not good enough to freeze any though like this year - and they will taste so good in the winter. What has been the biggest surprise to me though is the lettuce. I have never grown it before and really didn't know what to expect with it. The seeds were so tiny and they needed a major thinning once they all sprouted. I always thought lettuce was a cool weather crop that didn't like the summer heat. We have had a continuous supply all summer. The more I pick it, the more it grows. I haven't had to buy any lettuce at the market all summer long. That one little packet of seeds that I bought on clearance at the end of last season has served us well. 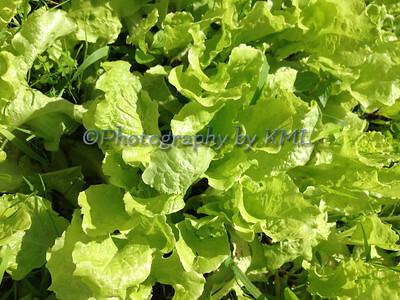 I will be sure to make lettuce a staple in the garden each year now - whether we get the seeds on clearance or not.